I bet if you stopped and thought for just a moment (even a brief moment) you could come up with at least one popcorn lover you know. For me that's super easy...because it's me! I love popcorn and eat it as a snack quite often. It's something that I can eat plain, with toppings, or like a gourmet dessert. What! What? A gourmet dessert?? Yes I meant to say that. Just think about popcorn drizzled with yummy chocolate and caramel. Now doesn't that sound like a gourmet treat to you? I know it does to me. I love the holidays because there are all sorts of fun popcorn treats out there. 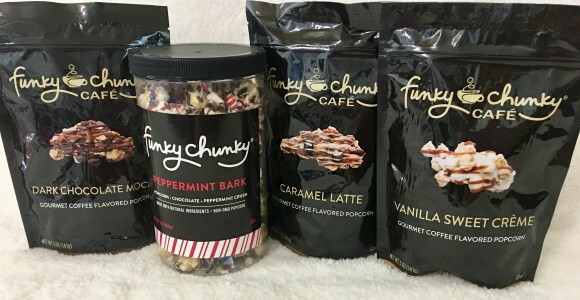 And this year to top it off Funky Chunky added a new line called Funky Chunky Café. It features that thing called popcorn we all know and love paired up with something else many of us also love...coffee! Right now it's available in Caramel Latte, Vanilla Sweet Crème and Dark Chocolate Mocha. And oh my let me tell you from the ones I've tried so far they are DELIGHTFUL! I'm saving a couple bags for an upcoming family dinner party we are hosting, but couldn't stop myself from digging into the Caramel Latte. I'm a sucker when it comes to pretty much anything caramel. A delicious combination of buttery caramel popcorn (Non-GMO), smooth white peppermint and dark chocolaty drizzle, sprinkled with peppermint crush. Light and fresh this combination should be shared at your family gatherings this holiday season. Each canister contains sixteen servings (16oz). Oh man this stuff does look delicious. I would love to try it!